Britain's Prime Minister Theresa May greets U.S. Secretary of State Rex Tillerson at 10 Downing street in London, Britain, September 14, 2017. LONDON - British Prime Minister Theresa May stressed the importance of a 2015 international agreement on Iran’s nuclear program to U.S. Secretary of State Rex Tillerson on Thursday during a brief meeting at her London office. Tillerson is visiting Britain to discuss the relief effort following Hurricane Irma, North Korea’s nuclear test, and to meet foreign ministers from several different countries about breaking the political deadlock in Libya. 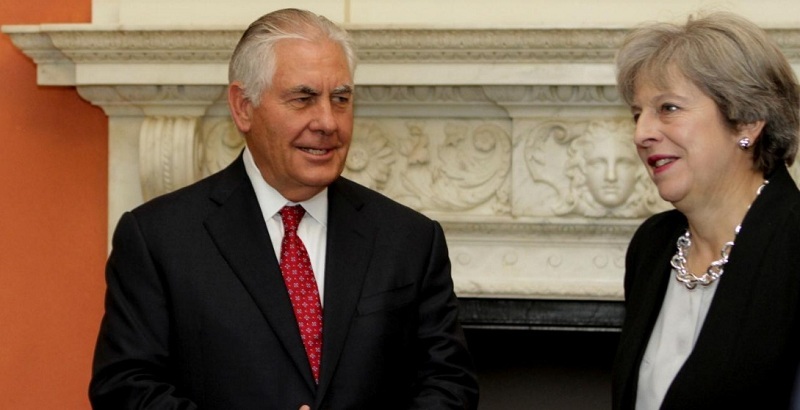 Although not officially on the agenda for the trip, the subject of Iran was raised at the meeting between Tillerson, May and Britain’s national security adviser. “(They) touched on the Iran nuclear deal, the PM underlining its importance in preventing Iran from procuring nuclear weapons,” May’s spokesman told reporters. U.S. President Donald Trump has previously expressed doubts about the Iran nuclear deal, which is designed to curb Iran’s nuclear program in return for lifting most Western sanctions. Trump is weighing a strategy that could allow more aggressive U.S. responses to Iran’s forces, its Shi‘ite Muslim proxies in Iraq and Syria, and its support for militant groups. Tillerson has publicly said he disagrees with Trump’s views on the nuclear deal, and that it could be used to advance the United States’ relationship with Iran. Backed by Western governments, the United Nations is trying to heal a rift between Libya’s rival factions in order to stabilize the country and to tackle militant violence and people-smuggling from Libya’s northern coast. British Prime Minister Theresa May stressed the importance of a 2015 international agreement on Iran’s nuclear program to U.S. Secretary of State Rex Tillerson on Thursday during a brief meeting at her London office.